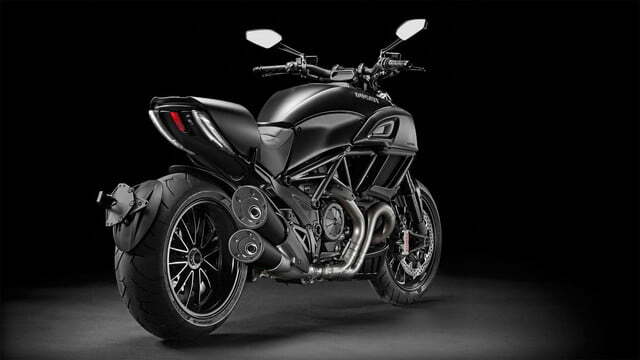 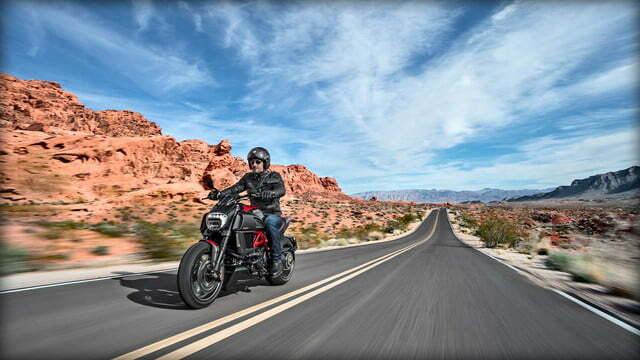 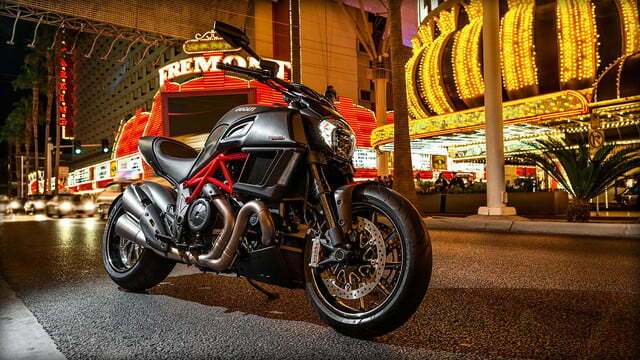 Ducati’s Diavel – the cruiser bike that really isn’t a cruiser, by cruiser metrics at least – has received a fairly extensive massage for 2015. 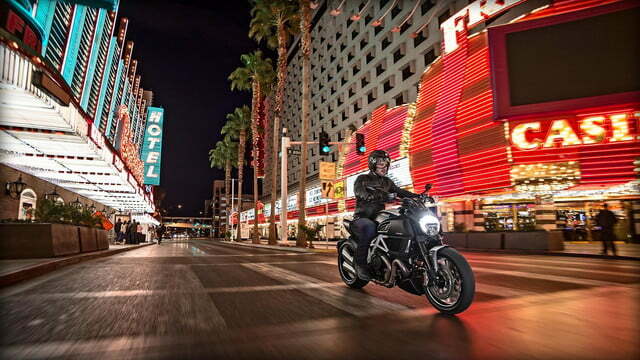 It remains a unique niche bike in the cruiser market and the latest changes shift its power peaks and sharpen up its standout style. 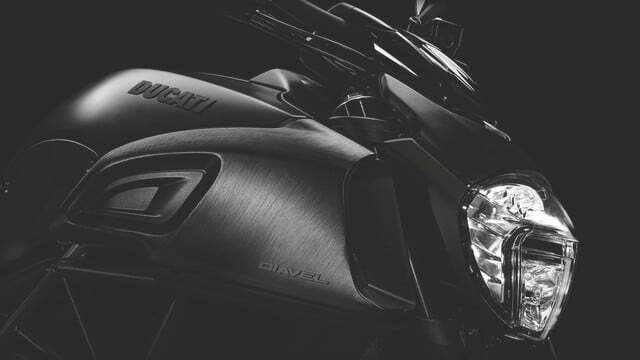 The previous split-style headlight has been replaced by a more pleasing but complex omega-shaped array of LEDs surrounding a central high-beam nacelle, a move almost certainly influenced by new owner Audi’s expertise in LED car lighting systems. 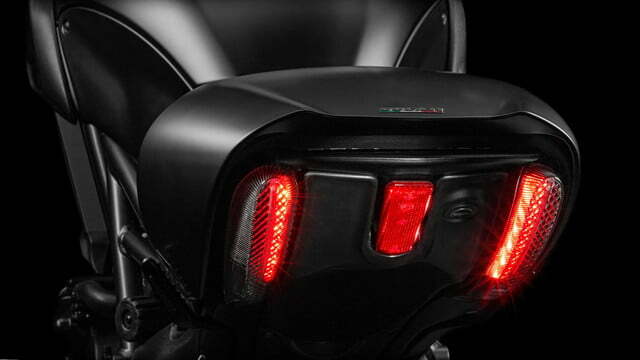 The layout looks more integrated than the previous half-moon design of the original headlight and more closely mirrors the LED taillight and turn signal strips out back. 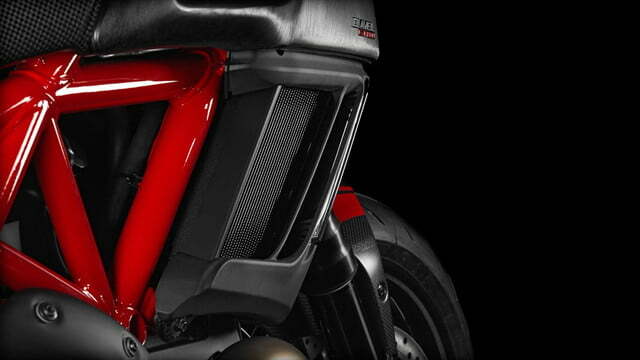 The bar and triple-clamp area has been tweaked and cleaned up, and – if I’m not mistaken – the twin anodized aluminum air intakes straddling the gas tank look more pronounced. 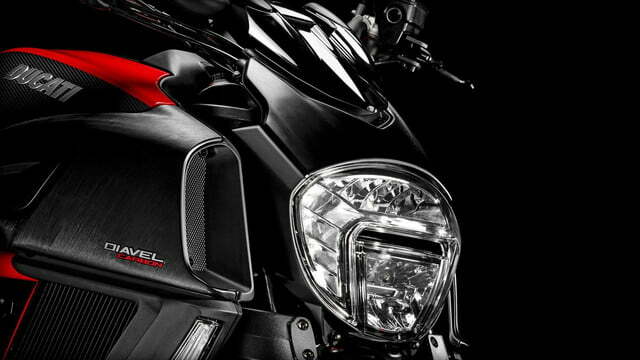 It’s been exaggerated so much that some might call out Ducati for cribbing from the Yamaha V-Max. 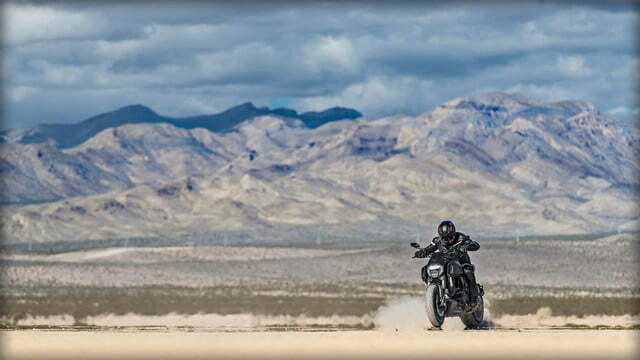 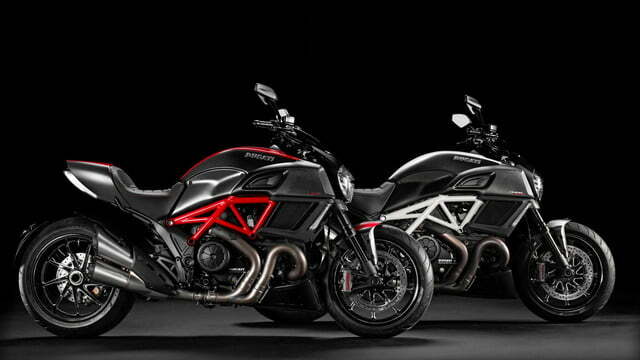 Although no one is going to confuse the two bikes, even at a distance. 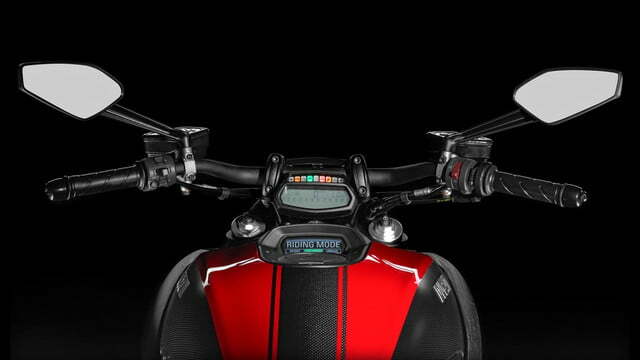 Beyond that, the instrument cluster has been split between a tank-mounted color LCD info panel and a primary mono LCD screen placed near the handlebar containing both tach and speedo (another V-Max convention). 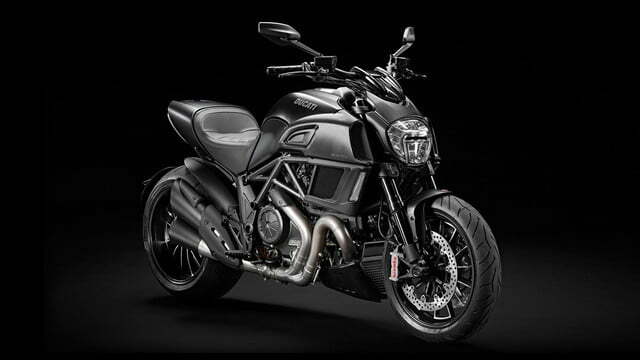 The Diavel and the V-Max (especially the older, pre-2008 versions) do seem to be brothers from another mother in some ways, with their standardized riding position, cupped seating, and predilection for big horsepower and torque numbers. 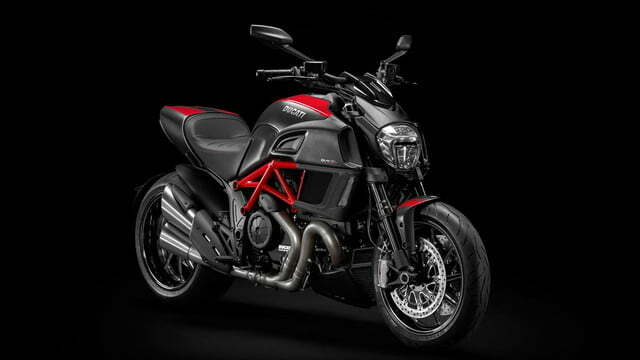 And those numbers now pencil out to 162 horsepower for the Diavel’s 1,198cc Testastretta V-Twin, which mixes in 96 pound-feet of torque. 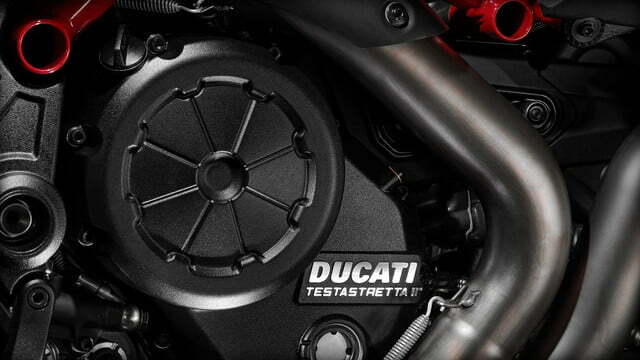 Ducati says the V-Twin’s twist now hits lower in the rev range for more acceleration/tire-shredding burnouts. 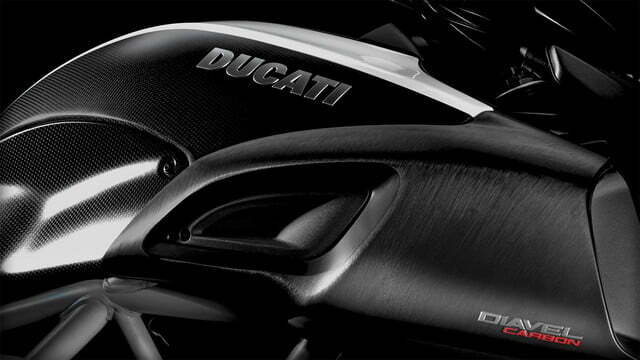 Peak torque arrives at 8,000rpm, a rev range most cruisers don’t even approach at all. 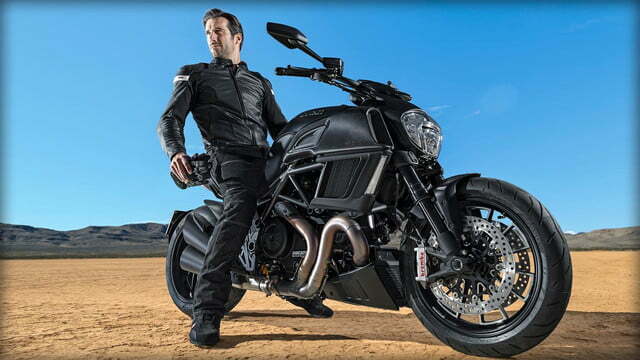 Peak horsepower comes just about 1,000 rpms later but also at a lower point in the rev range than last year for more usability. 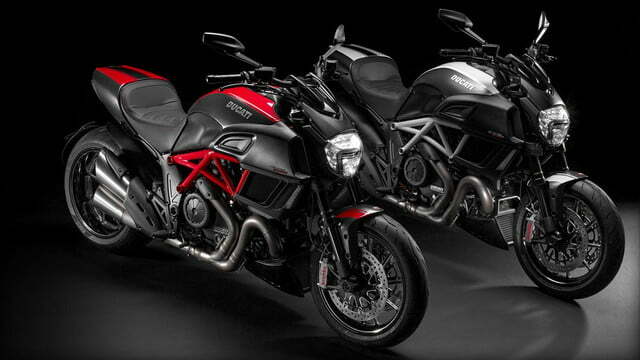 Restyled cans out back look nice enough, but will likely be quickly jettisoned for something from Arrow or Termi with a gutsier growl. 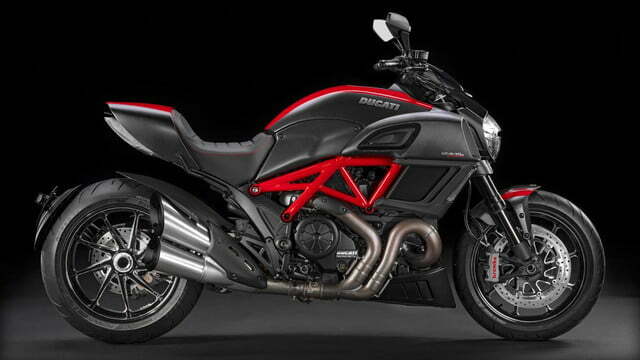 Final drive from the six-speed box to the 240-section rear meat remains chain-driven and the rear of the bike is uglied up by a mandated splatter guard growing out of the single-sided swingarm. 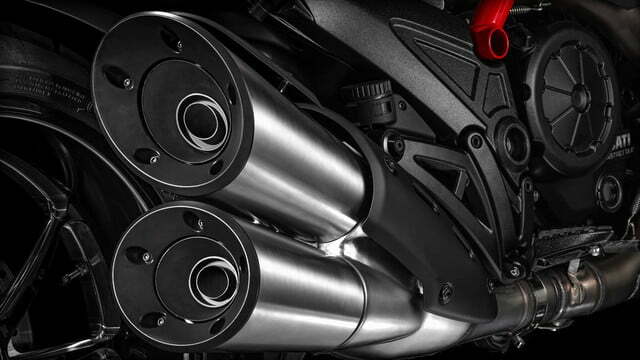 That ugliness, though, is nothing ten minutes and a socket set can’t solve. 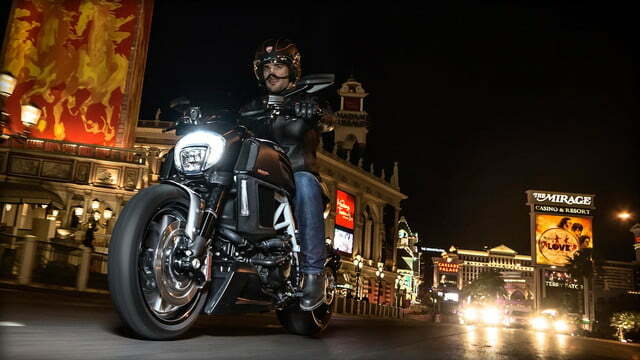 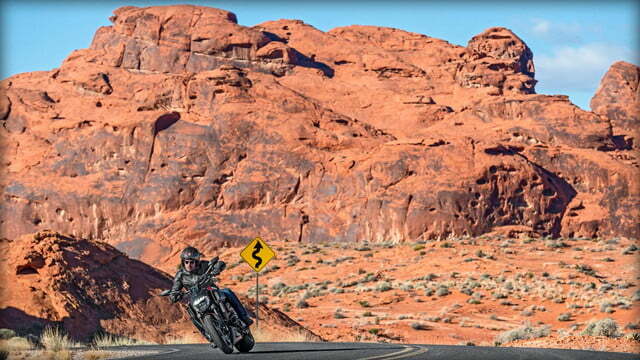 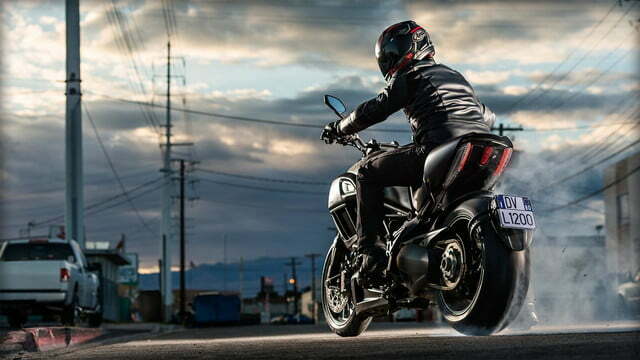 While the original V-Max was never really designed to scare sport bikes in the twisties, more than a few capable Diavel pilots have likely embarrassed some wannabe corner jockeys with its huge-for-a-cruiser ground clearance, horsepower, three ride control modes and slipper clutch. 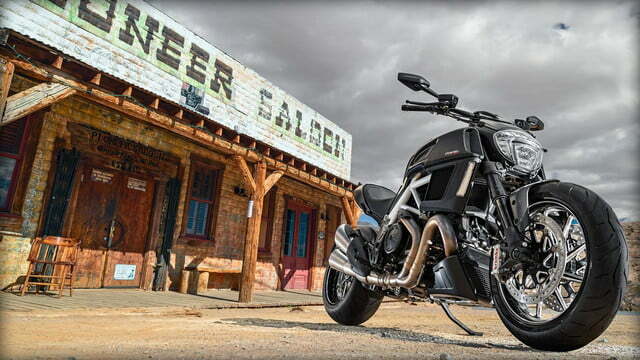 These features, I should mention, are absent from most boulevard boomers. 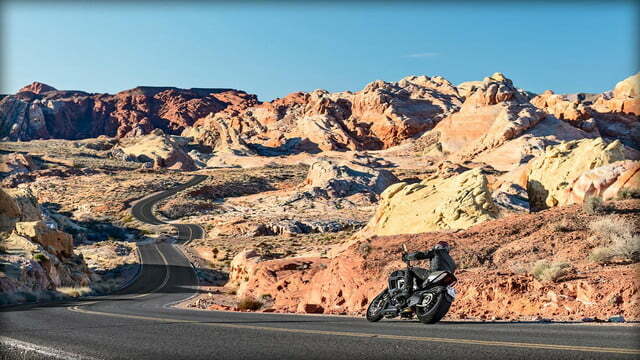 Standard Bosch ABS working through Brembo monobloc calipers work alongside a traction control system and ride-by-wire throttle that assists riders who have decided their back-breaking sport bike days may be over … but their aggressive riding time is not. 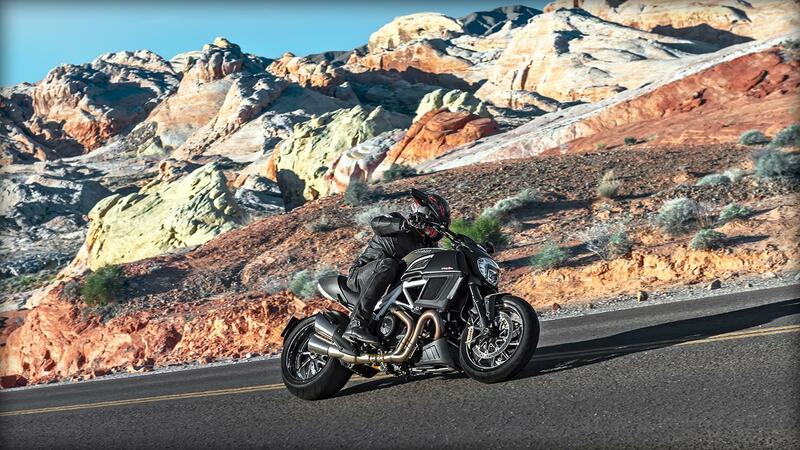 For the lightweight-bike-obsessed, a more-expensive Carbon (fiber) version of the Diavel that shaves 12.5 pounds off the base bike’s 463-pound dry weight is also available. 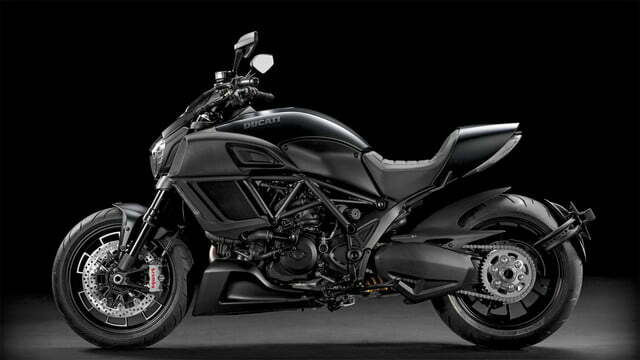 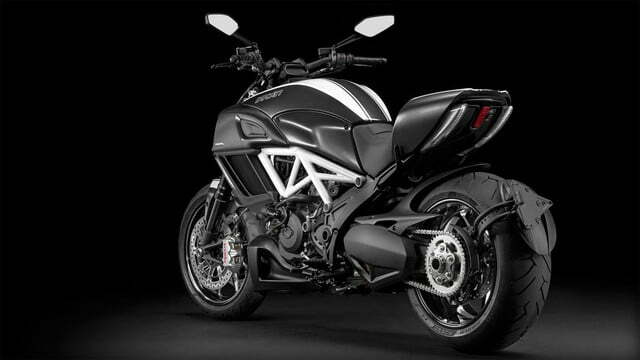 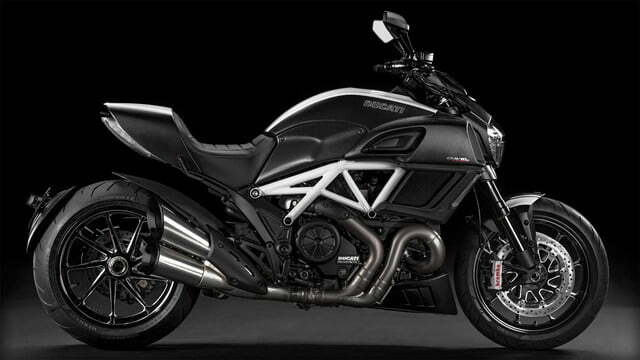 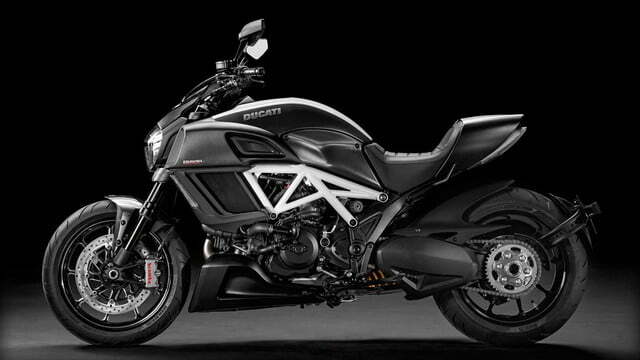 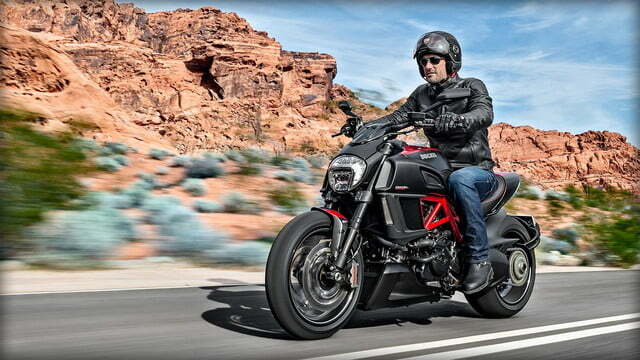 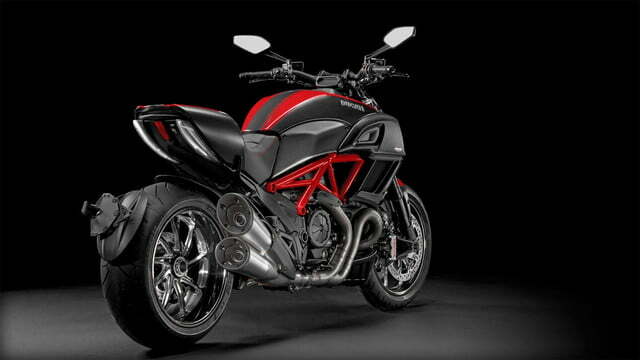 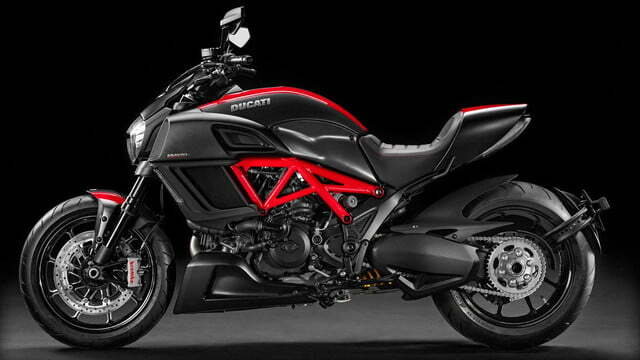 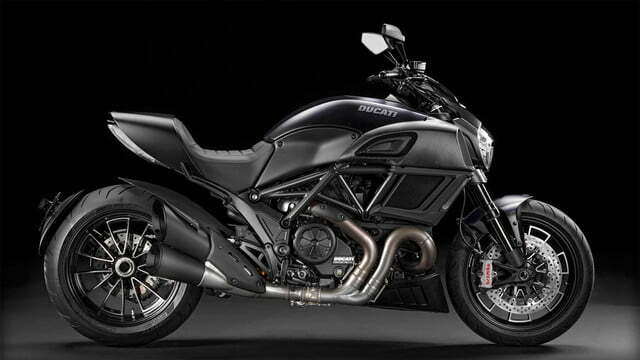 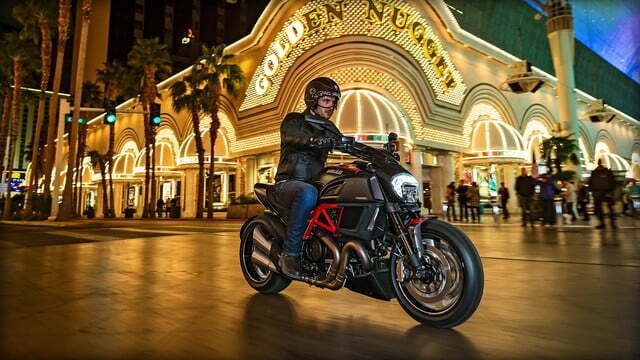 Many in the riding community were incredulous about a Ducati “cruiser” when the Diavel debuted in 2010. 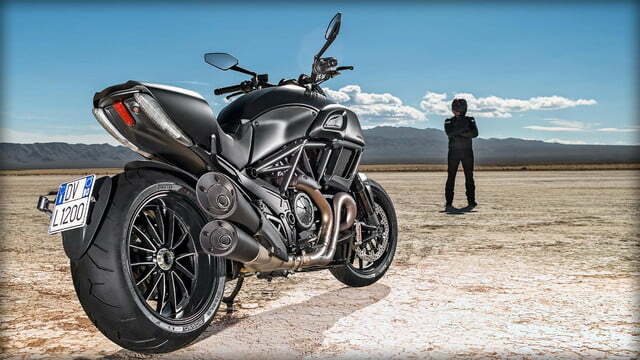 The bike’s very different look, performance capabilities, and comfort (not something Ducati was known for) have changed more than a few minds. 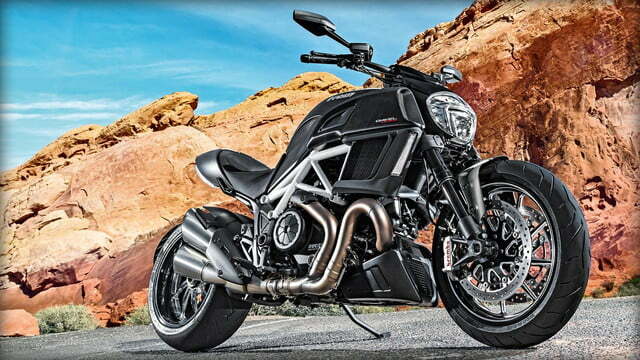 Accordingly, the Diavel is a solid seller, especially with women riders and fellas closer to retirement than their college days. 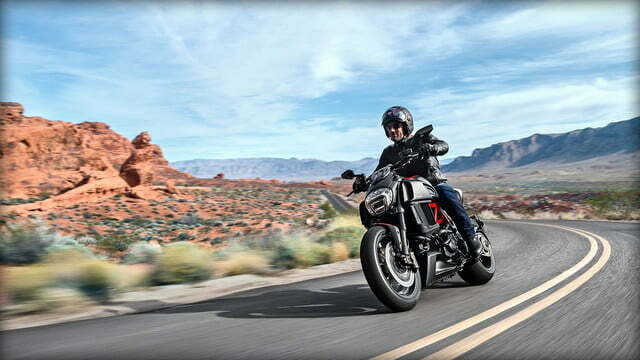 The changes for 2015 will likely contribute to its growing popularity. 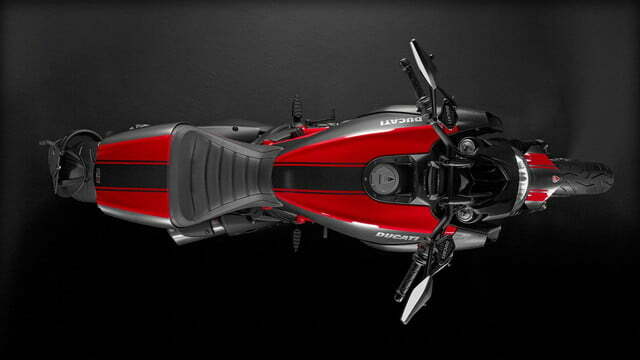 Gumpert gives glimpse into reliability of its new supercar, calls it "Explosion"